Vice President-elect Mike Pence and his wife Karen arrives at Trump Tower, Nov. 15, 2016, in New York. U.S. President-elect Donald Trump and Vice President-elect Mike Pence are meeting Tuesday about key appointments in their new government, with aides signaling that former New York Mayor Rudy Giuliani could be named secretary of state. Trump and Pence have more than 4,000 jobs to fill in the U.S. government as they prepare to assume power January 20, but their immediate focus is on filling the top diplomatic post and that of defense secretary, attorney general and Homeland Security chief. All are positions that present the government's face to the world and help lead the country's fight against terrorism. The 72-year-old Giuliani has no previous foreign policy experience; but, Trump associates say he has emerged as a narrow favorite to become secretary of state. He was a loyal supporter of Trump during the billionaire real estate mogul's lengthy run for the presidency leading to his stunning upset win a week ago, often appearing on television news shows to promote the Trump candidacy. The blunt-spoken Giuliani gained national prominence during his tenure as New York mayor more than a decade ago. For many Americans, he became a symbol of U.S. resolve in the fight against Islamic terrorism in the aftermath of the 2001 terrorist attacks on New York and Washington that killed nearly 3,000 people. 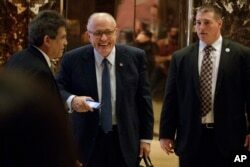 Former New York Mayor Rudy Giuliani, center, smiles as he leaves Trump Tower, Nov. 11, 2016, in New York. At the time, he said, "Tomorrow New York is going to be here. And we're going to rebuild, and we're going to be stronger than we were before...I want the people of New York to be an example to the rest of the country, and the rest of the world, that terrorism can't stop us." Giuliani's appointment, however, is not certain. Trump aides say the president-elect also is considering other names, including that of John Bolton, a hawkish former diplomat who was the country's United Nations ambassador under President George W. Bush. Bolton has been a regular television critic of the foreign policies of President Barack Obama, contending that he has needlessly diminished the country's standing in world affairs. Senate Armed Services Committee member Sen. Jeff Sessions, R-Ala., arrives at Trump Tower, Nov. 15, 2016 in New York. U.S. media reports say that another Trump supporter during the election contest, retired Army General Michael Flynn, once the head of the U.S. Defense Intelligence Agency, is a possible pick as national security adviser. 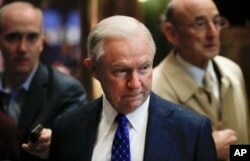 Alabama Senator Jeff Sessions, an early Trump campaign adviser, could be named secretary of defense or attorney general, the country's top legal position. A Trump spokesman, Jason Miller, said Trump and Pence, meeting on the 26th floor of the president-elect's Trump Tower in New York, would "be reviewing a number of names" for key positions. "There will be non-traditional names, a number of people who have had wide-ranging success in a number of different fields," Miller said. "People will be excited when they see the type of leaders the president-elect brings into this administration." One conflict Trump is facing is between his vow during the campaign to "drain the swamp" in official Washington and now his need to find qualified officials with experience to handle the government's most challenging positions. 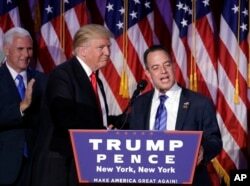 FILE - In this Nov. 9, 2016, file photo, President-elect Donald Trump, left, stands with Republican National Committee Chairman Reince Priebus during an election night rally in New York. So far, Trump has made just two appointments. He picked Reince Priebus, the chairman of the Republican National Committee, as his White House chief of staff, a selection applauded by Republican leaders who control both houses of Congress. Trump's choice of Stephen Bannon as his chief strategist has drawn widespread criticism from Democrats and some groups outside the government. 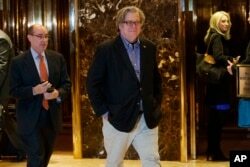 Bannon was the Trump campaign's chief executive, joining his election effort in its last months after leading Breitbart News, a website he once described as "the platform of the alt-right," which occasionally has been the home to white nationalist and anti-Semitic vitriol and anti-women views. FILE - In this Friday, Nov. 11, 2016, file photo, Stephen Bannon, campaign CEO for President-elect Donald Trump, leaves Trump Tower in New York. Trump is set to become the country's 45th president and the first ever to never have been elected previously to public office, or served in its military or been appointed to a high-level government position. He also will be the fifth White House occupant who lost the popular vote in the presidential election but won through the country's Electoral College system of picking its leaders. In essence, U.S. presidential elections are a series of state-by-state contests, with the winner in each collecting all the electoral votes. The biggest states hold the most sway in the Electoral College, where Trump, when all the votes are counted, is likely to finish with a 306-232 edge over his Democratic opponent, former U.S. Secretary of State Hillary Clinton. But Trump, because he won narrowly in numerous states, while Clinton had a large vote count advantage in two of the biggest states, California and New York, trails her in the popular vote count by more than 670,000 votes. Trump, in the past, has attacked the two-century-old Electoral College system as a "disaster for a democracy" and said in a television interview after the election, "I would rather see it where you went with simple votes." In tweets on his Twitter account Tuesday, Trump said, "The Electoral College is actually genius in that it brings all states, including the smaller ones, into play. If the election were based on total popular vote I would have campaigned in N.Y., Florida and California and won even bigger and more easily." Clinton and Trump both contested the large southeastern state of Florida, which Trump won, but neither campaigned much in New York or California, where Clinton's dominance ahead of the election was a foregone conclusion.